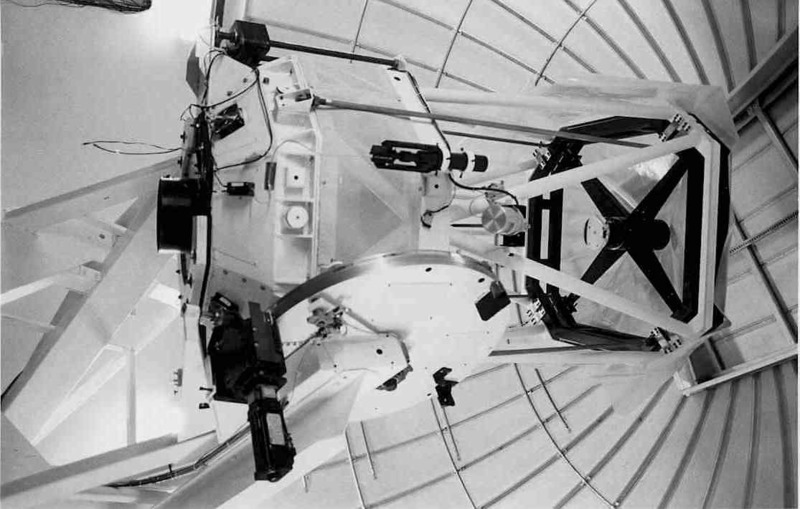 The 1.3-m telescope, formerly the southern-hemisphere 2MASS survey telescope, uses a split-ring altitude-azimuth mount and an optical design optimized for work in the infrared. A Novel Dual Imaging CAMera (ANDICAM) is permanently mounted on the 1.3-m. ANDICAM takes simultaneous optical and infrared data by using a dichroic with a CCD and a HgCdTe array. A moveable mirror allows dithering in the IR while an optical exposure is going on. ANDICAM is operated by the Prospero control software. It also has a twin--DANDICAM (Dutch ANDICAM)--that is used on a 1m telescope in South Africa. With ANDICAM one can obtain BVRIJHK photometry within a 6 arcmin (optical) or 2.4 arcmin (near-IR) field. Detailed characteristics of the instrument can be found here. ANDICAM has been in regular operations at the 1.3-m since February 2003 by the SMARTS Consortium. Previously, it had been operated in queue mode on the 1.0-m (YALO Consortium) with the optical detector since the 1998B semester. The IR array was installed in July 1999. ANDICAM was constructed by the Ohio State astronomical instrumentation group led by Darren DePoy and its construction was funded in part by the National Science Foundation. Once a proposal has been accepted, the PI needs to submit an observing plan to the queue manager. This plan consists of a set of observations to be carried out. Each "unit" observation of is described by one or more data-acquisition template files called "Observation Templates" or "obs files". Obs files define the target parameters and the instrument and exposure configuration of the smallest schedulable "unit observation" that can be acquired with the ANDICAM. A "unit observation" means that the choice of filters and the base integration times for each channel are fixed, but multiple images with those filters and integration times may be acquired. Similarly, IR channel observations can be dithered between images using internal tip/tilt mirror. If observations with different filters or exposure times are required, the astronomer must create a different obs file. Obs files define "unit observations", specifying the instrument, detector, and target parameters and configurations needed to acquire a single observation. In addition, astronomers can create simple Multi-Observation Scripts that are used to execute a sequence of obs files for a single target. Two basic uses for multi-obsrvation scrits are complex synopic observations, and survey observations. When satisfied with your Observation plan and Observation files, use the Phase II Submission Form to submit them to the SMARTS 1.3m telescope queue for implementation, along with a set of detailed instructions for how to execute your observing program. Once an observation for your program has been carried out, an automated notification will be sent to you via email. Within a day or two the observatons will be distributed via the SMARTS FTP site, along with calibration frames and photometric standards. Your data will be under a directory named after your proposal ID, IR flats are under the directory flatsir/, and optical and IR photometric standard stars are under standardsccd/ and standardsir/, respectively.